You know when sometimes you have all the ingredients for a beautiful manicure, but somehow the final result ends up being just somewhat nice and really nothing special. There's really nothing wrong with the manicure, but it just isn't as gorgeous as you had pictured it would be. Well, that's exactly what happened with this manicure and for that reason I have had these pictures hanging in my folder for quite a while... But I thought I should just finally post these nails and be done with them, so here they are. Like I said, nothing wrong with the ingredients as both of the Rainbow Honey polishes I used for this manicure are really beautiful ones! Sword Lily is a gorgeous jelly filled with golden flakes and iridescent glitter, whereas Foxglove Foxtrot is a beautiful pink and purple topper with a mix of smaller and larger dot glitters, some hexes and shimmer. They are both from Midnight Garden Collection and I think they are both quite summery ones, though they also (at least together) made me think of Valentines Day. I used two coats of Sword Lily on my thumb, index and pinky nails though I think I should have added third one for the depth and overall look. For my middle and ring fingers I used first two coats of OPI Don't Bossa Nove Me Around and then one generous coat of Foxglove Foxtrot. Like with all these type of glitters I had to use a bit time to place the glitters so that they wouldn't be all in one place, but overall this still applied quite nicely. Here's the whole arsenal of products that I used... I wanted to use IsaDora Peel Off Base under those glittery nails to ease the removal and I also topped them first after the glitter with a coat of Nail Pattern Boldness Glitter Food to make them look smooth. Or does this type of thing happen do you guys too or am I the only one? As promised I have couple OPI Ford Mustand collection comparisons to show you guys today! If you missed my swatches of the four polishes that I got from this collection, you should check out yesterday's post, here. 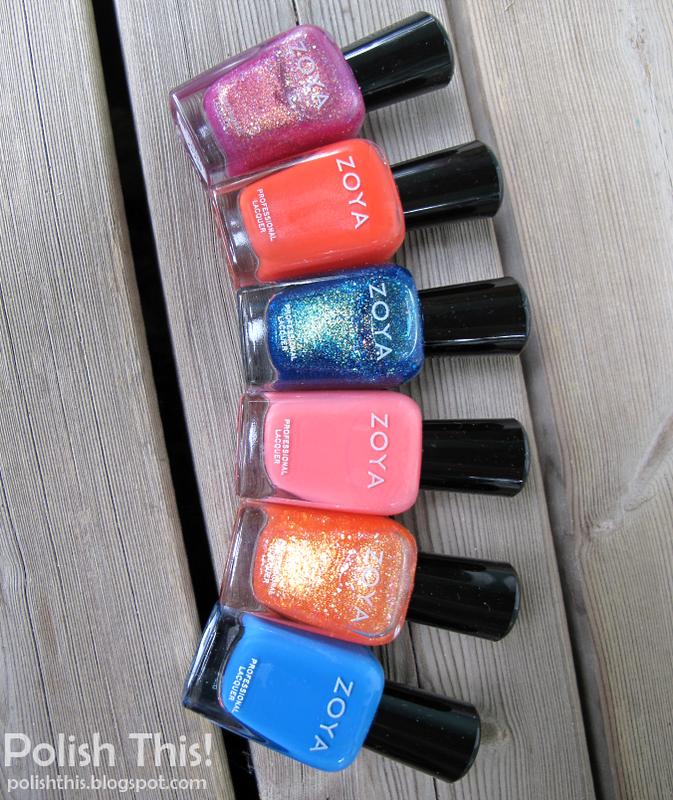 When I applied OPI The Sky's My Limit on my nails it immediately reminded me of Zoya Charla (and those many other dupes). In the bottle they do look quite similar though the shimmer in Charla leans more towards green. I have here two coats of The Sky's My Limit on my middle and pinky nails and three coats of Charla on my index and ring finger nails. Compared side to side Charla clearly has more turquoise look whereas The Sky's My Limit looks more blue, even though it also has some greenish shimmer in it. Charla is also a bit more sheer than the OPI one as it needs three coats for full coverage whereas the OPI needs only two. They are both gorgeous polishes and I will surely keep and need them both since I love these type of blue polishes and these are definitely not dupes. I own quite many red cremes though I'm not sure if I really need those since red is a bit difficult color for me. 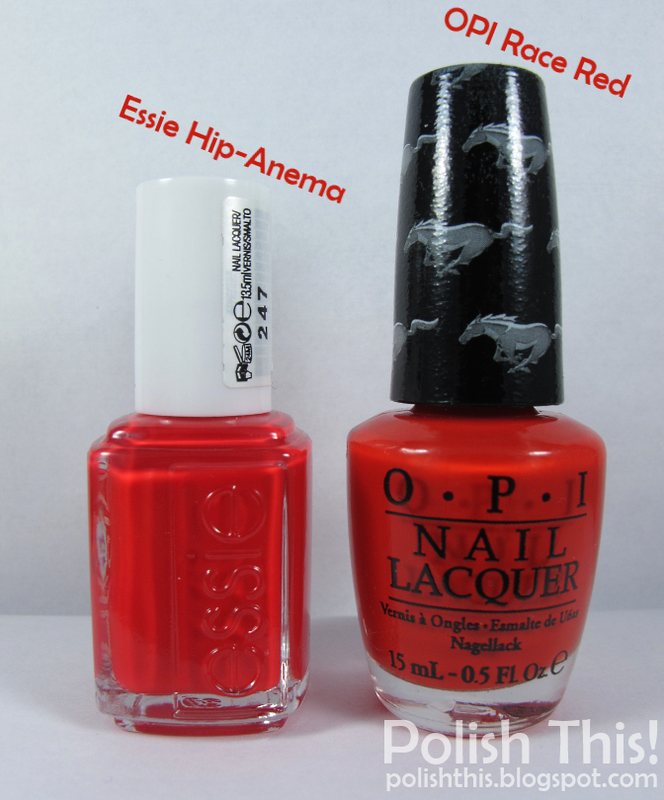 However, many of my red cremes are cooler toned reds whereas OPI's Race Red leans strongly towards orange. So I decided to compare it with the one red creme I have that is also quite warm toned and leans towards orange, Essie's Hip-Anema. As you can see here, the two are not dupes but they definitely are close. Both apply quite nicely, though I'd say Race Red glides on even more easily. They both cover with two coats. Compared to Hip-Anema, Race Red looks just slightly more orange toned. Even though I usually prefer Essie over OPI, this time I'd say my favourite is Race Red just because somehow the more orange color looks better and the quality of RR is amazing. I also already did a bottle comparison picture of Race Red and Coca-Cola Red in this haul post and those two are definitely not dupes. I also wanted to compare OPI Girls Love Ponies, but I soon realized that I don't really own anything like it. The closest one I could come up with from my stash was Zoya Reagan and it's definitely totally different color as it's more purple whereas Girls Love Ponies is pink. That's why I didn't even compare these two on my nails. There's of course probably plenty of polishes that are close to or even dupes to Girls Love Ponies, I just don't have any. From the pictures this could be quite close to the pink from OPI's Gwen Stefani collection, Hey Baby. 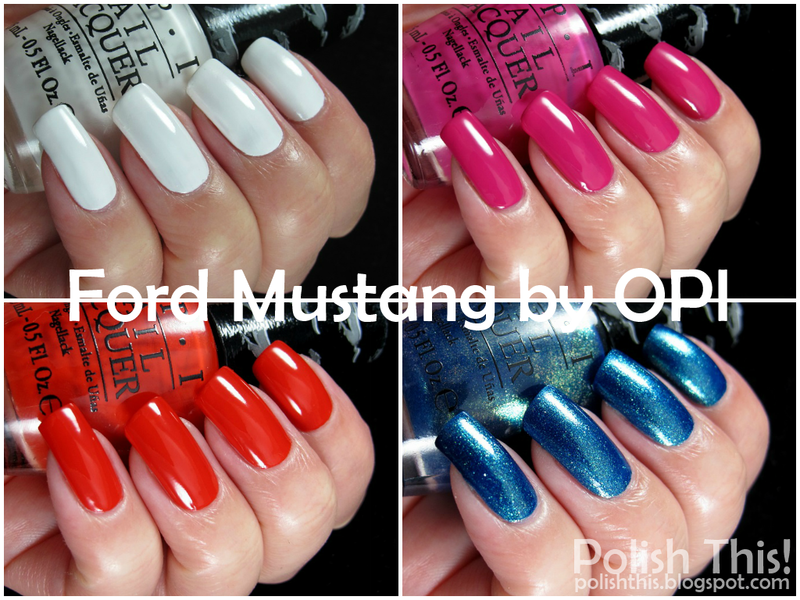 Today I have my picks from the OPI Ford Mustang collection to share with you guys! I'm not really a Ford girl, but I'd take a Mustang any day and I'm sure many of you would too. I'm really liking this collaboration and I ended up buying four out of the six polishes from this collection. The gold and the black one weren't really my type of colors, but the other four looked really intriguing. I did swatches of all those four for you and I also have some comparisons, but I'll show you those in another post. But let's see those swatches now, right?! Angel with a Leadfoot is a pretty basic white creme. Nothing too exciting, except that it's always nice to find a good white! I have here two coats with a top coat and I have to say that this was pretty good for a white polish. It wasn't the most self-leveling one that I've seen, but it wasn't too bad either. First coat was a bit patchy, but second coat made it look pretty good and the coat of top coat evened everything out nicely. Not bad for a white creme! Girls Love Ponies is such a bright and fun pink creme, I love the color! It's a perfect pink as it isn't too 'cheap' looking as some pinks tend to be, but it's still a gorgeous bright color. This applied pretty much itself, it was almost a one coater, but I did two just to be safe. I don't have any top coat here, so it levels out really nicely and it's so shiny even alone! I was a bit hesitant of getting this Race Red since I thought I already have too many red cremes. This color turned out to be so gorgeous that I'm really glad I got this, I love it! This leans quite heavily towards orange, so it's not a basic red creme rather a orange-red creme. Did I already say that I love it, oh yes, I believe that I did... This was really easy to apply, just as Girls Love Ponies was. I have two coats here, no top coat. 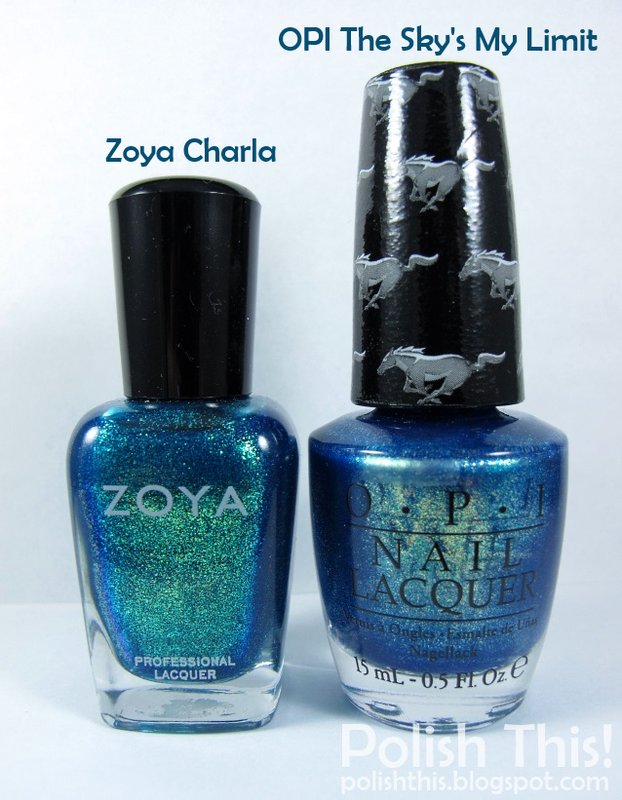 Last but definitely not least is The Sky's My Limit, a beautiful metallic blue shimmer. This was the one that looked most intriguing in the promo pictures and this certainly didn't disappoint me. The blue color is so gorgeous and the shimmer makes it even more pretty! Once again, I used two coats here, no top coat. This was yet another easy one to apply, so I really have nothing to complain. For a blue-lover like me, this is of course a must-have! You all probably already figured out that I really liked all these four polishes that I got from the Mustang collection! I haven't been too into everything OPI has done lately, but this was really a success to me. I even looove those wrappers around the caps with the Mustang logo, I think they look really great. So yeah, two thumbs up for OPI for this collection! Today I have the first nail art that I did with those Sally Hansen I Heart Nail Art Pens to share with you guys! This was of course inspired by the gorgeous half moon nail art manicure done by the very talented Lucy from Lucy's Stash and mine isn't as sharp and clean looking as the inspiration, but I still liked this look very much! Drawing with those Sally Hansen nail art pens was very easy. I was in hurry, so I didn't have time to practice at all, I just draw the design straight on my nails... I would have probably ended up with even better results if I had tried this design first on nail wheel or something, but not bad with the first try, huh?! And that's mainly thanks to those nail art pens, if I had tried this with some sort of nail art brush and polish I would have probably failed miserably. My lines became quite thick, once again probably because I didn't do a practice run. I think you can do a bit thinner line with these pens if you want to. I have had some other nail art pens somewhat like these before, but I have always had a problem with those because the color hasn't come out of the pens evenly and you easily end up with a pile of color in one place and pretty much nothing in another. I didn't have any problems like that with these pens, the color came out very evenly and it was pretty much like drawing with a pen! My base colors for this manicure were Zoya Skylar and OPI My Favorite Ornament. As you can see, I used two different colors of those I Heart Nail Art Pens for this: (Fine) White and (Fine) Turquoise. Lastly I needed to seal the design with a coat of top coat and I decied to try IsaDora Gel Nail Lacquer Top Coat for these nails. As you can see, it at least it didn't ruin the design or my nails in any way. It did cause me some unfortunate shrinkage on the tips of the nails, but I'll tell you about that and my other findings about using the top coat over regular polishes on another post! Back to these nail art pens; the tip on these pens is really nice, it's not too thick but it's not too thin either. You can really do so many nail art designs with these! 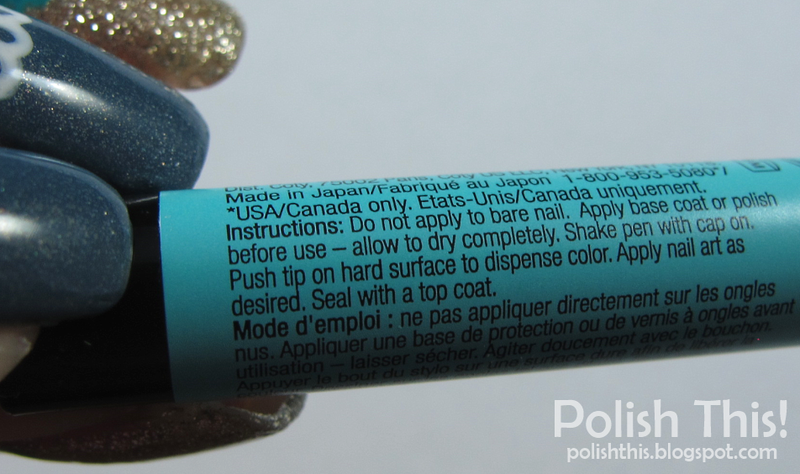 The instructions are really straightforward; you just need to let your base (base coat or base coat and polish) to dry completely before applying these. Then you just shake the pen and push the tip on hard surface for the color to come out. I only needed to push these couple of times and then the color started to come out really easily. Then you just do your nail art as you want to and finally, like I already said, you have to seal the design with a coat of top coat. 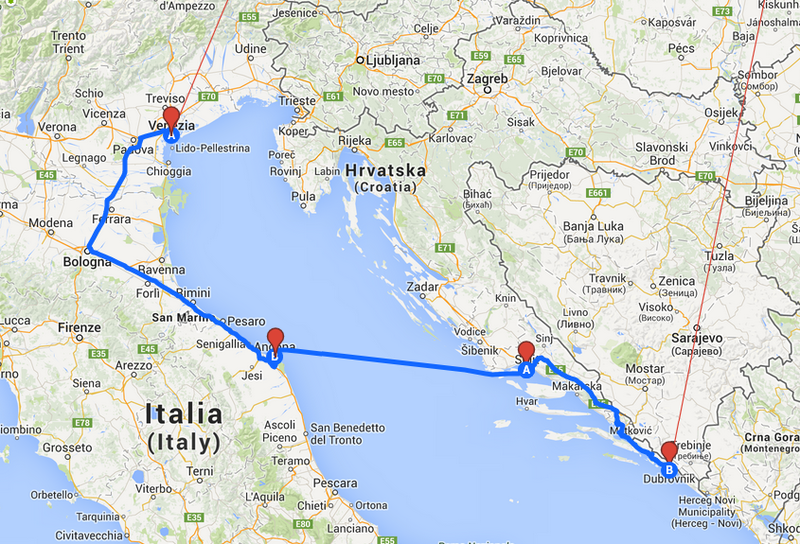 So yeah, really simple and easy! I really liked these pens and I see myself doing more free hand nail art now that I have these, because for some reason getting the brush and acrylic paints always seems so hard... Also, these are handy for other nail art decorations too, you could for example use this to mark the spots you want to place your studs, rhinestones, loose glitters etc. I find it sometimes hard to get those in straight line or in some desired form, so you could use this to mark the spots first and then if you are not happy with the layout, just wipe it off and start again. 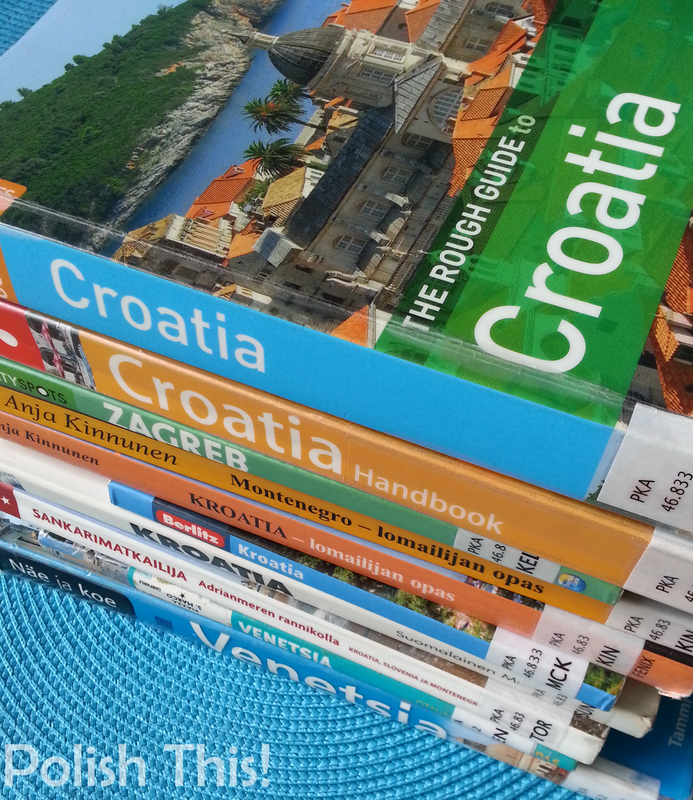 Really handy! And the nail art opportunities with these are pretty much endless, so yep, I looove these! 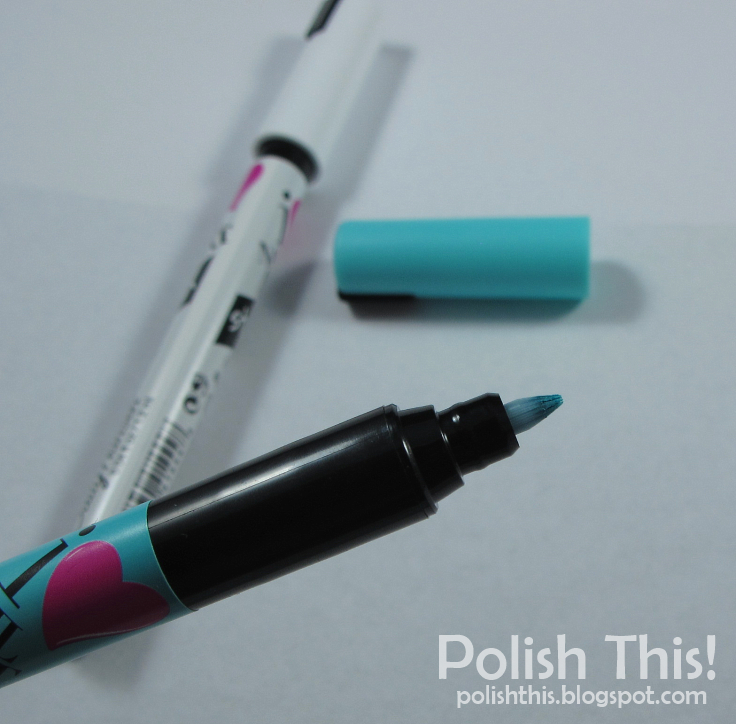 Have you guys tried any of these type of nail art pens? What do you think about these? *Disclosure: I have gotten the nail art pens and the top coat used here for review. Other products I have bought myself. For more information view my disclosure policy.